The Pioneer Museum main facility in Long Lake, Minnesota was formerly the Long Lake school house which was later consolidated into the Orono School District. Other facilities are the former Independence Town Hall, located west of	Maple Plain, Minnesota and the Wolsfeld Cabin, located on the grounds of the city of Medina's offices. The museum has four main display rooms upstairs in former classrooms. The Victorian Room with displays of a Victorian dining room, kitchen, bedroom and parlour. 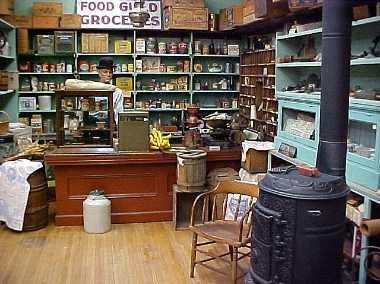 The General Store Room with displays of guns from the landmark Buckhorn restaurant, a general store display and miscellaneous displays. The Textile Room has a loom, quilts and other textile related materials. The Music Room has displays of vintage instruments and music players, a hand carved pulpit, the megalethscope and a vintage 1900 classroom. On the lower level we have a research facility for people who want to use our archives and a picture gallery of early western Hennepin County pioneer families. Come in and find your family's roots in Hennepin County! Take an on-line tour of these rooms and come in and visit in person!